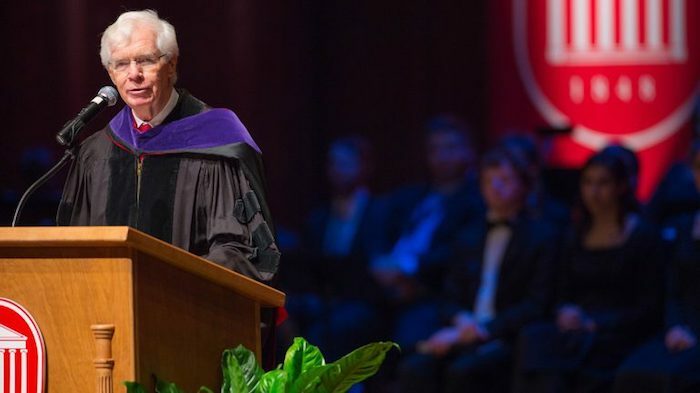 Former U.S. Sen. Thad Cochran (BA psychology ’59 JD ’65) has left a lasting legacy on the University of Mississippi, as well as the state and nation. To honor his many contributions to the state, the UM School of Law is hosting a Nov. 11 tribute to the longtime political leader and public servant. The event will raise funds to support the Thad Cochran Endowment at the School of Law, which will provide scholarship opportunities for future students. Cochran’s education at the university set the foundation for his many years of leadership and service. In 1963, he was installed as an officer of the Phi Delta Phi International Legal Honor Society. A year later, he was elected Honor Council chairman by the law school’s student body, all while serving as editor-in-chief of the Mississippi Law Journal. He earned his J.D. in 1965. Education shaped Cochran’s life from the beginning. His father, William Holmes Cochran, was a high school principal and his mother, Emma Grace Cochran, was a teacher. During his time in law school, Cochran studied international law as a Rotary Foundation fellow at Trinity College in Dublin, Ireland. He has been awarded honorary degrees from five other colleges and universities. The Thad Cochran International Law Fellowship will recognize the impact of international education by providing Mississippi resident students at the law school with opportunities to study abroad and gain new ideas and perspectives. The former senator hopes these students enjoy the transformational and inspirational perspectives that he gained in his international experience. Cochran was elected to the U.S. House of Representatives in 1972. After serving two terms in Congress, he was elected to the U.S. Senate in 1978, replacing retired U.S. Sen. James O. Eastland, beginning his career that spanned nearly four decades. As a senator, Cochran was instrumental in the selection of 23 federal judges and served as chairman of the Senate Appropriations Committee. Throughout his career, he has touched every higher education institute in the state in some way through his advocacy. He developed a relationship with Hinds Community College through the service of his parents, with Mississippi State University through his work on agricultural research and with his alma mater, which will house and preserve his congressional records. While he wanted the institutions to succeed, his focus was on the students, working to ensure that Mississippians could get education to become productive and fulfilled citizens. Through the Cochran Endowment scholarships, Mississippi residents who are community-oriented law students dedicated to service and cultural development will be able to earn Ole Miss degrees. The school’s Thad Cochran Dean’s Strategic Initiative Fund will recognize his legacy and carry on his mission of training attorneys with the knowledge, skills and temperament to serve the court on and off the bench. Before his career as a public servant, Cochran practiced law in Jackson, served as an officer in the U.S. Navy and worked as an educator. He taught military law and naval orientation at the Officer Candidate School in Newport, Rhode Island, with a focus on public policy issues. The Thad Cochran Military Promise Program will provide law scholarships for students seeking legal careers in the military. It also will provide scholarships for veterans seeking additional legal education and resources for training law students to assist current and former military personnel with legal issues. On April 1, Cochran retired as the 10th-longest-serving senator in American history. During this year’s UM Commencement, he was honored with the Mississippi Humanitarian Award, which is presented to those with a major impact in shaping the state. Contributions also will support the preservation, processing and management of the Thad Cochran Collection in the Modern Political Archives, part of the University Libraries Department of Archives and Special Collections. This summer, Cochran donated to the university more than 3,500 linear feet of physical records and 5 terabytes of electronic records spanning the last 45 years of his career. This resource will provide researchers an opportunity to explore correspondence, reports, photographs and recordings, offering insight into some of the most significant political events in recent history. “Sen. Cochran is one of the university’s foremost champions and advocates,” Chancellor Jeffrey Vitter said. “He also represents what we hope all Ole Miss graduates will become: an intelligent and hardworking leader with excellent character. Hosts for the event include: former state Supreme Court Justice and Mrs. Reuben Anderson; former Gov. and Mrs. Haley Barbour; Mr. and Mrs. Joseph C. Canizaro; Mary Ann Connell; Mr. and Mrs. Roger Flynt; Mr. and Mrs. Paul Franke; Mr. and Mrs. Edward Fritts; Martha Scott Poindexter and Robert Guenther; Mr. and Mrs. Keith Heard; Mr. and Mrs. Richard Howorth; Rachelle M. Johnson; former U.S. Circuit Judge Grady Jolly; MSU President and Mrs. Mark Keenum; Chancellor Emeritus Robert C. Khayat; Delta State University President and Mrs. William N. LaForge; Mr. and Mrs. William Lewis Jr.; former U.S. Sen. and Mrs. Trent Lott; Mr. and Mrs. Alwyn Luckey; Former Gov. and Mrs. Ray Mabus; Mr. and Mrs. Charles Overby; Ambassador John Palmer; former U.S. Rep. and Mrs. Chip Pickering; Mr. and Mrs. Clarke Reed; Mr. and Mrs. Joe Frank Sanderson Jr.; U.S. Sen. Cindy Hyde-Smith and Michael Smith; Mississippi College President and Mrs. Blake Thompson; Chancellor and Mrs. Jeffrey S. Vitter; U.S. Sen. and Mrs. Roger F. Wicker; Curtis Wilkie; and Mr. and Mrs. Williams Yates Jr.
For tickets or more information about the event, contact Suzette Matthews at suzette@olemiss.edu or 601-937-1497. To donate, visit https://umfoundation.com/SenatorCochran.